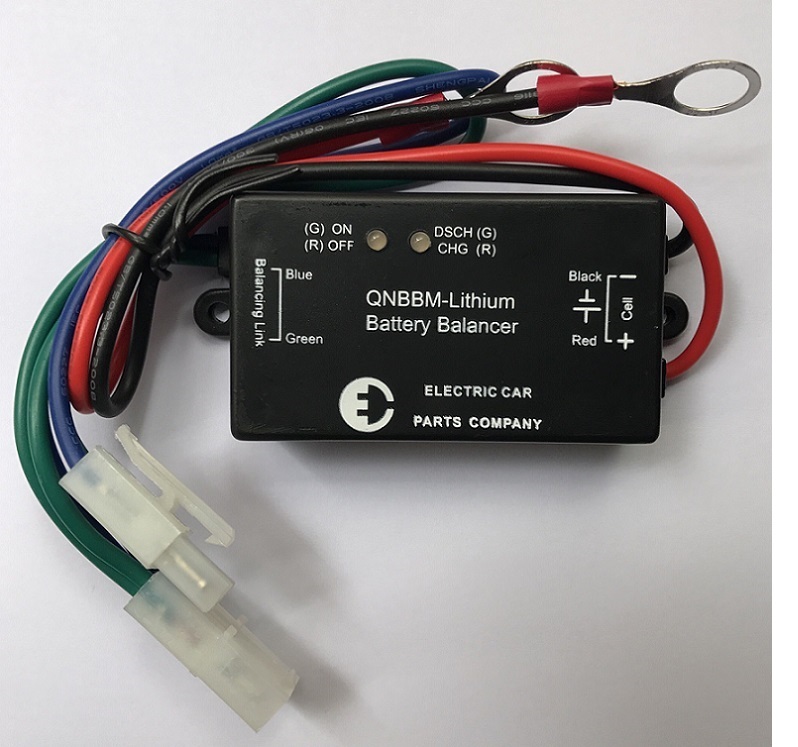 Battery Voltage Balancers with LED Indicator Lights | Electric Car Parts Co.
Works with all Lithium Chemistry Batteries! Up to 6 Amps (6000mA) Continuous Balancing! The individual cells in a battery pack are rarely an exact duplicate of all the cells in the battery pack. In actual practice, when a pack of batteries reaches a specified charge cutoff voltage then the charger will shut off. If one cell in a pack reaches that voltage before other cells reach a full charge it will cause the charger to shut off – prematurely denying the balance of the pack a full charge. Conversely when the weakest cell in a pack reaches its discharge cutoff voltage it will show as the discharge point and shut down the pack prematurely – thereby denying the user the balance of energy the other cells have stored. These battery equalizers prevent this from happening. This yields up to 30% more power and will extend the life of the battery pack. Keeps your batteries voltage difference within 10mV! and 8S+8S+8S+4S in the back. Note: This balancer emits a very high-frequency tone that some people can hear if they are within 10 feet. 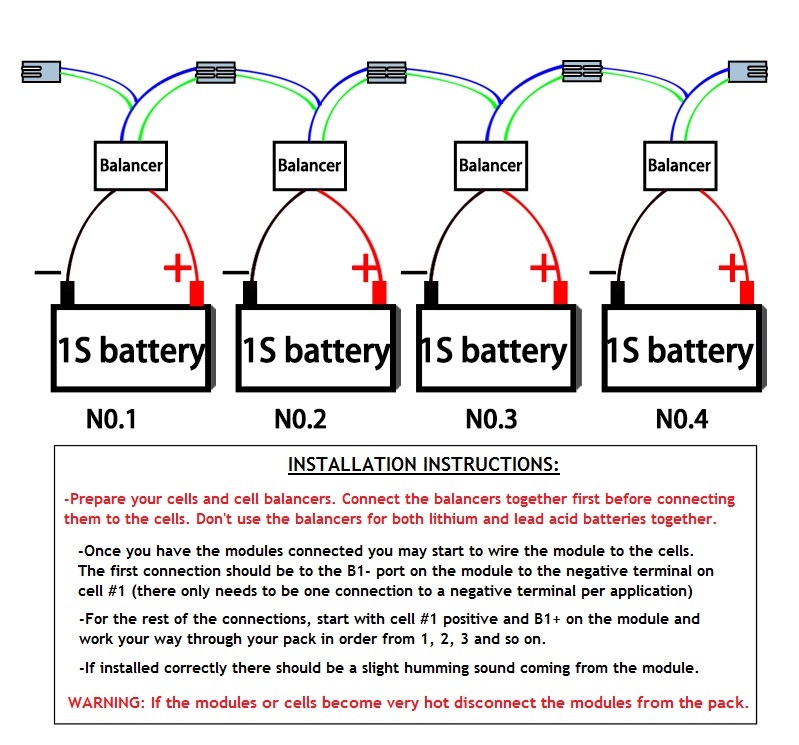 Note: Please check wiring diagram for how to connect these modules or contact us to avoid making mistakes during installation. 1. Measure the voltage of the batteries with a multi-meter to see if all the batteries voltage is normal. 2. Listen. If the balancers are connected correctly, they will produce a high-frequency sound. Because the sound is quiet, you need to get close to the balancers. The more balanced the batteries are, the smaller the balance current it will have, and the softer sound they will make and vice versa. If they are connected the wrong way, you won’t be able to hear the sound. Why should I use the balancer? 1. Keeps your batteries voltage difference within 10mV! 2. Keeps your batteries safe always. No overcharging or over discharging. 5. Low price. You pay a small amount of money to protect your battery. Compared to the cost of replacing your expensive lithium battery, the balancer is very cheap. 6. Fast delivery. 1~2 business days after payment arrival. How does the balancer work? How does it protect batteries? This diagram tells you how the balancer works. Each battery is compared to a cup. Each balancer is like a pump. With the pumps, all the cups will have the same level of water. The balancers are connected in parallel to the batteries. They won't affect the charging or discharging of the batteries. There are 2 ways to get an exact quote for the base shipping for your LiFePO4-LiMn2O4-NiMH 3V 1S Battery Voltage-Amperage Balancer/Equalizer order. We’ll research the exact shipping cost and send you an invoice to your PayPal or email or you can add it to your pallet in $1 Shipping Increments for your LiFePO4-LiMn2O4-NiMH 3V 1S Battery Voltage-Amperage Balancer/Equalizer order. Si se encuentra en un país hispanohablante (América Latina / España) y desea comprar este producto, deberá ponerse en contacto con Reid. Es un proceso realmente simple que consiste en enviar información de envío (dirección y fecha de llegada deseada) @ [email protected].